On June 2nd, 2009 the first of two aerial operations for the rodent eradication took place today in perfect conditions with the required 3 dry nights forecast. 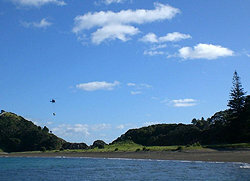 The helicopters and DOC operations were based at Omarino Farm on the mainland at Waipiro Bay – from a spectacular viewpoint. 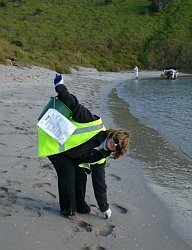 DOC staff and Guardians volunteers did a thorough job of the monitoring and beach pick up on the islands as required by the Resource Consent. 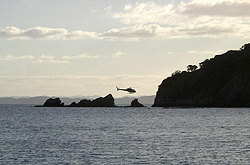 The helicopters worked from west to east starting at Motuarohia (Roberton) Island and once the main islands had been completed, the numerous rock stacks were done by manual application from the air.